Final Cut Server is able to see files and folders that are available to a system through a variety of means. This could be an Xsan or a folder on an Xsan, an nfs mount from another host, a folder through FTP, etc. Basically, if you can see some data through the Finder reliably then you can go ahead and add it to Final Cut Server. Speeds of clients to access the data then depend on the ability of the clients to access that data either in place or through the Final Cut Server application. Each top level folder that you will be accessing through Final Cut Server can be considered as a Device. You can have 3 or 4 folders on the root of an Xsan and define each as a device or you can make the root of an nfs volume you mount a device, or some subfolders within it. Once a device is created you can use it to store media and automate actions with the device. Previously, we created a device using the System Prefernece pane for Final Cut Server. Here, we will use the Administration utility to do so, which provides a bevy of other options. 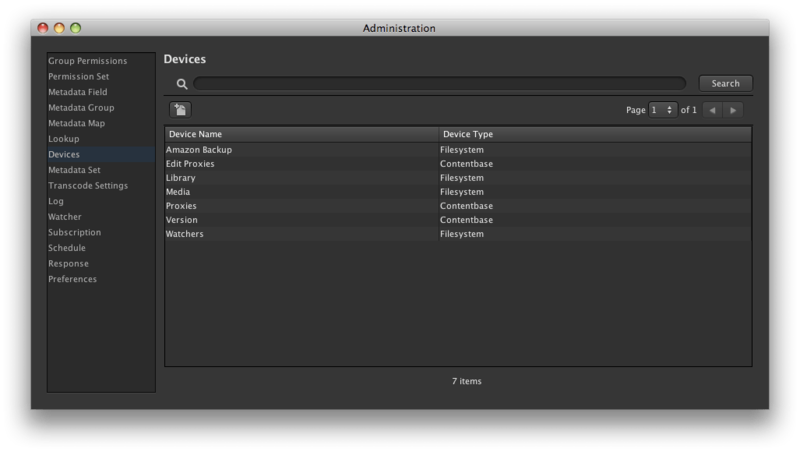 To create a device, open Final Cut Server and open the Administration utility. Then click on the icon to create the new device, seen below: At the next screen, you will likely choose to create a Filesystem device (although FTP Server is a common way to access media from or send media to another host, especially a remote one). If you’re using a Filesystem device (which is basically just a folder accessible to the Final Cut Server) then you will see a screen similar to the one below. Here, type the applicable information for the path and other information. You can just type a path in the Local Directory field, or fill out relevant information for smb or nfs where authentication might be required. Once you are satisfied with those settings, you can choose whether or not to generate thumbnail images on the device using the Generate Thumbnails checkbox, as seen below. Next you will edit the URI and URL fields. This allows you to tell a client what path to look for in order to determine whether or not the host is local and it can therefore edit content in place (eg over Xsan) or whether clients will access the data through Final Cut Servers built in caching mechanism (through Ethernet). For most environments you can leave the analyze mode as-is. If the device will be used to store archives, then you will want to check the box for Archive. If you will be using the device as an archive location then you can assign post archive commands and pre restore commands (which can call a restore to the path from the Time Navigator or Bakbone command line utilities. Once you’re satisfied with your settings, click on Save Settings and you’re done!